The first of four competitions in ideas for the best digital policy tool that should deal with the problems faced by the region took place in Sarajevo on February 26th and 27th. Twenty competitors designed and presented innovative solutions in the fields of fighting corruption, media literacy and environmental protection. After two days of intensive work, members of the international jury – Ralf Sauer (Siemens branch management), Vesna Bajšanski Agić (Mozaik foundation), Marko Rakar (MRAK services Ltd) and Bojan Bošković (EXIT and Share foundation) selected the winner. 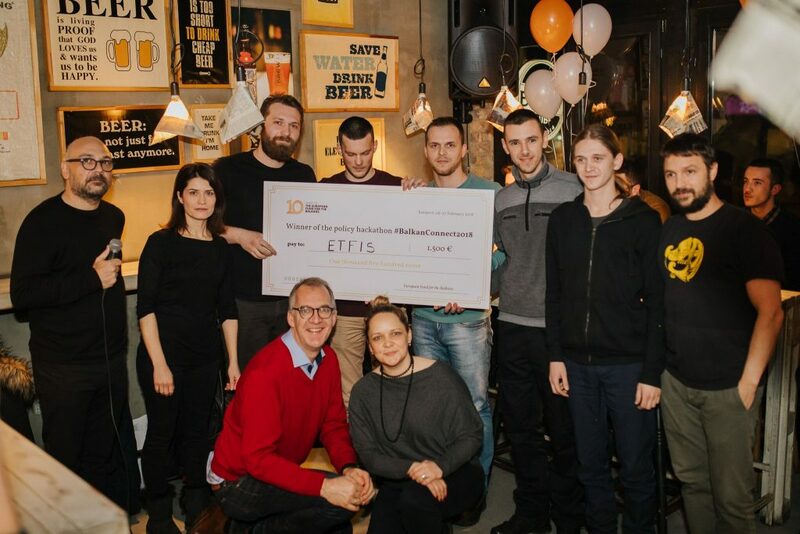 The winner of the Sarajevo policy hackathon is ETFIS team, which developed the idea of Smart garbage container for tackling pollution, waste management and recycling issues. Other participants also had outstanding proposals for digital tools such as Hive platform for influencing good governance, Media C Index – a fact checking tool, and KoDok – web application for fighting corruption in healthcare system. Policy hackathons #BalkanConnect2018, launched to encourage the development of innovative solutions for influencing the public policy, will be continued on March 3rd and 4th in Belgrade.